I’ve been married three times. With every divorce I managed to salvage my books, plants and animals from the wreckage that once was a grand love affair. Fortunately there were no children. It was a blessing to know that I’m not responsible for sending damaged goods to a therapists couch, but it also left me without a family of my own. My mom come to visit often enough and I see my brother and sister, but they have their own lives, their own families. But ever since I started living my dream in my Toorkombuis, I have been blessed with a family of my own. 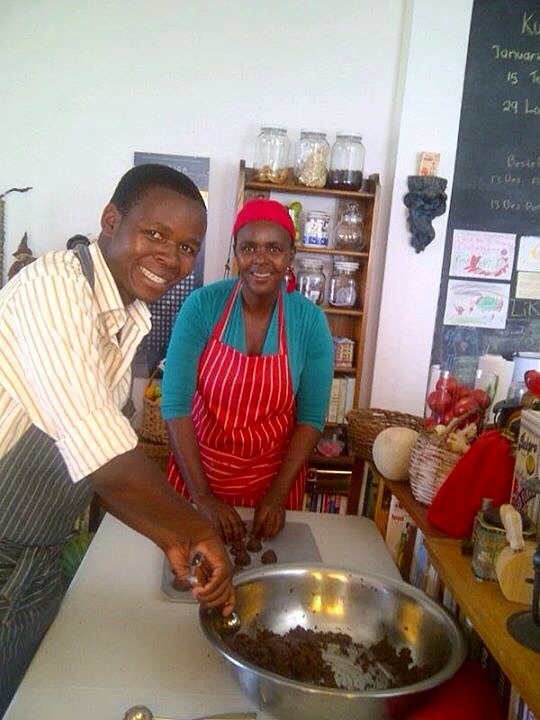 That I realised one afternoon when I sat down to lunch at the table with my two helpers, Zuki and Maswazi. We start the day with house cleaning and, as soon as those chores are done, we start baking to supply in the ever increasing demand for my Romany Creams. I prepare the mixes and they start spooning hundreds of little chocolate mounds onto the baking trays. We operate like a well-oiled machine. While they put the one tray after the other in the ovens, I start preparing our lunch. And when we have finished sandwiching the last cookies with their precious Lindt filling, we set the table and sit down for lunch. It was a just a practical arrangement, part of the routine until one afternoon . . . I sat back and basked in the atmosphere of contentment. It was then that I suddenly realised that this is my family and how very fortunate I am to have been blessed like this. And when I cook for my family, I cook from the heart.